As part of our study abroad program, we are required to do community service while we are here in Ho Chi Minh City. I’ll admit, when I first heard this I wasn’t thrilled, but what I initially dreaded has quickly become my absolute favorite part of our program. We work with two very different groups, on Thursdays we teach/practice English with a group of priests that live in a seminary here in the city. There are three groups, each with about 15 priests. I was so nervous when we first started, I have zero experience with teaching English and I didn’t know if I would be any help at all but the men are a really fantastic bunch and every Thursday we all leave so full of joy and energy. Everywhere we go, people are eager to practice their English. We have been approached in coffee shops and restaurants by people we have never met asking if we would be willing to practice English with them. I have to remember that I may not be the best teacher but the groups we work with are just eager to have a chance to practice. The second group we work with is at SMILE Foundation, an organization that works with children whose lives have been affected by HIV. This is truly the highlight of my week. We are teaching English here as well, using a computer program and one on one interaction. These kids are SO smart and most have a pretty good grasp of the language. Smile has some pretty amazing projects happening in the future, including planting a community garden that the kids will run. I really do leave the center every Sunday feeling so much better than when I arrived. I highly encourage any Loyola students to volunteer here if they get the opportunity. In exactly 4 days it will be approximately one month since I left the U.S. In some ways it seems like the shortest 3 weeks of my life, but in other ways I feel like I left half a year ago. Pau has been treating all of us well. We took our placement tests and began our language classes last week. It’s non-stop French for almost 6 hours every single day, 5 days a week. On top of that the Palois usually do not speak English so you’re immersed in French even more. USAC runs its language program differently than the U.S. does. The whole semester will be a continuation of everything we’re learning. We do not know when we are crossing into the next level of French, we simply keep building and building our language knowledge every single day. Although we have our chosen elective with American students (and one Australian) from USAC, our language classes included people from all over the world. For example, I have students in my classes from India, China, Russia, Africa, and the U.K. That is one of the distinct difference from the French classes I have taken in the United States. Not all of these students know English well, so the only language we have in common is French. So even in between classes we (attempt to) communicate in French. It’s surprising the many hand motions and sounds a person is able to come up with to explain something. Sometimes the Russian student and I resort to speaking Polish and Russian, since they are both Slavic languages. USAC also provides us with three excursions during our semester in Pau. This past weekend we traveled to the Basque Country. We visited Bayonne, St. Sebastian and St. Jean-de-Luz. 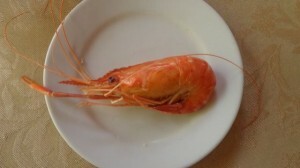 While staying here in France, I have come to learn so much about Pays Basque. The culture is completely separate from French and Spanish even though it lies in both France and Spain. The language has no origin, but is said to be oldest language in Europe. It is not related to French or Spanish at all. (For example, San Sebastian is called Dostonia in Basque). Students in both Spain and France can take Basque as a foreign language, same as they would take English or Russian. The Basque people have their own culture: folk dances, traditions, ways they celebrate Catholicism, things they’re known for, etc. The trip was absolutely amazing. San Sebastian took my breath away and made me realize how lucky I was to be experiencing such a great trip. The next excursion we have is in October to the Pyrenees, and then we have one in November to Saint-Bertrand-de-Comminges (Prehistoric Caves). Time for class! Au revoir! 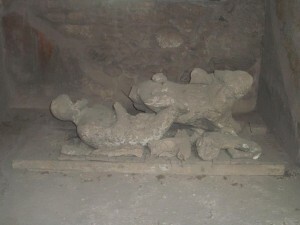 A Broad, in Pompeii and Herculaneum! Hello readers! Yes, this is my 3rd post tonight. I’m in a blogging mood, I guess (and I owed you a few weeks of posts). This weekend I went on a day trip to Pompeii and Herculaneum with a few new friends from SLU, Xavier, Fordham, and Loyola (well I guess that one doesn’t really count as a “new friend” since we go to the same school!) We left campus at 7am to catch an 8:30 train to Napoli (Naples). After a three hour train ride we were ready to hit the train and head to Herculaneum. After a few travel errors on the metro (three of us accidentally stayed on the metro when we got to our stop and we got separated from the group!) we finally made it to Herculaneum. 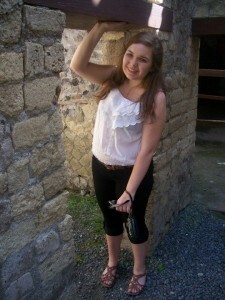 Herculaneum was made for my height! Herculaneum was amazing. 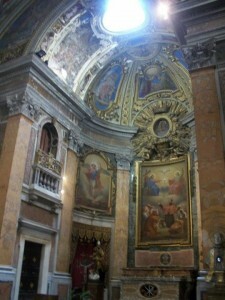 Not only was it beautiful and fantastically preserved, we were also about to walk through essentially every part of it. It felt more like a playground than a historical sight. We could walk down the roads, through the houses, and touch the walls and counters that the citizens of Herculaneum had touched. That was the most exciting part for me. Knowing that I was walking through houses that are almost 2000 years old, standing where people stood as Mount Vesuvius erupted….incredible. Overwhelming. Molly and I in the Theater! After Herculaneum we hopped back on the metro and headed to Pompeii. 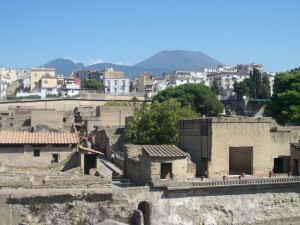 Pompeii, in contrast to Herculaneum, is huge, and expands across a giant park. As you’re walking through you can almost get a “big city” feel. 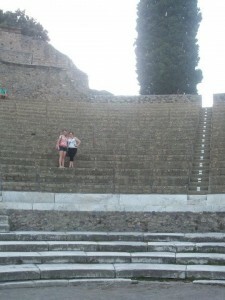 We saw a stadium (stadio, it Italian), a theater, houses, stores, basilicas, every part of normal day life. For someone like me, Pompeii was almost too much to comprehend. For years I’ve been watching History Channel specials, reading books, and studying every part of Pompeii and its tragedy. To suddenly be there, in the space, walking through streets that until fairly recently were completely covered to the world….words can’t describe. I eventually stopped taking pictures and just let myself soak it all in. This is where people lived and worked and grew and one day in 79 AD their world just stopped, perfectly preserved in time. You can still see the frescoes on the walls, the marble on the counters, the tiles on the floor. It’s as if the citizens one day just stood up and walked away. Watching it on TV and reading about it doesn’t do it justice. It’s absolutely something that you need to experience in person. Although a long day (We got back on campus as 12:30 at night!) it was absolutely worth the trip. To anyone thinking of studying abroad in Italy make sure to put this on the top of your list, because it will truly touch you in ways you never imagined. The calcio field. Where heroes are made, dreams are shattered, and Jforcers learn the true meaning of studying abroad at the JFRC. At least that’s what I was told by friends who have studied at the JFRC before. Calcio, aka soccer, is a huge part of the JFRC. Every semester a league is formed and teams compete all semester until there is one team left standing. As someone who lacks the sport gene I was a little apprehensive about signing up. My soccer career ended in the 2nd grade with an asthma attack, and I was nervous about attempting to get back on the field. 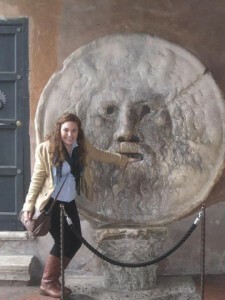 On top of that I was completely unprepared, I hadn’t even brought sneakers to Rome! After a few days of slideshows, testimonials, and SLAs telling me I would “kick myself if I didn’t sign up” I gave in and put my name on the list. A red, white, and blue 15 euro pair of sneakers later (courtesy of a street vendor) and I was ready to hit the field. I had been put on the Maroon team, lead by SLA Matt, and with my #6 jersey on I rushed the field. It. Was. Awesome. I might have no eye/foot coordination, lack any sort of running ability, and haven’t touched a soccer ball in over 10 years but it was still an amazing time. I’m definitely not one of the stars of the team, but what I lacked in skill I made up for in enthusiasm. All the teams went out without any practice and yet by the end my team was working together, passing, scoring, and dominating. Our team was constantly screaming, cheering, and encouraging other teammates. By the end of the game everyone’s skills had drastically improved (I even headbutted the ball at one point!) and it was so exciting to see us grow more confident with each kick. We went into the half leading 4-1, but unfortunately lost it right at the end, 5-6. Even with the loss we were amped up by the end of the match, and are ready to WIN at the next game! I’ll make sure to keep you (my loyal readers) updated! I promised to try to post more and here’s the next one! Let’s go back to my 3rd week in Rome. You would think after three weeks the thrill of studying abroad would have worn off, but I can assure you it has not! After our Orientation Trip we all fell back into the rhythm of classes, homework, and mensa…until Wednesday, that is. On Wednesday I had my first on-site class for Art in Rome at the Roman Forum and Colosseum (more on classes in a later post). After spending three hours learning about the architecture and history of two of Rome’s most famous spots, we headed back to campus to prepare for the Mass of the Holy Spirit at St. Ignatius Church that night. St. Ignatius Church, first, is absolutely stunning. You walk into this huge expansive space with these amazing frescoes that expand from the back to the front of the church (in my opinion their beauty rivaled that of the Sistine Chapel). A “fake” dome is frescoed above the alter, although it took me about halfway through mass to realize that it wasn’t an actual dome. I was lucky enough to cantor the mass with a few other girls from the JFRC. Although a little shaky we made it through without any practice! And the space is so incredible that any sound in it just echoes and turns into this haunting melody. Absolutely fantastic. 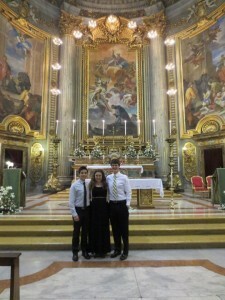 Following mass we went to dinner in a restaurant near Piazza Navona, where I had a life changing experience. We were served this pasta, which is really indescribable. The pasta looked like a type of tortellini, and was served in a cream with light pumpkin sauce. The real kicker was when you bit into the pasta where there was this rich pear flavor. I had to stop eating and just breath I was so overwhelmed. The food here never stops amazing me. After the churches we went to the Capitoline Museo (Museum), which is this HUGE museum with famous pieces such as the She Wolf Statue and the Dying Gaul. We spent three hours wandering around and still didn’t see it all. Part of the museum also has this incredible overlook where you are right about the Forum looking out over the city of Rome. I’m telling you, everywhere you turn in this city it looks like a postcard. The next day Father Al (one of the priests at the JFRC who is possibly the funniest person I’ve ever met) took a group of us on a tour of the Vatican. After running into one of his Swiss Guard friends (I’m telling you, he is the coolest) we headed inside. No matter how many times I’ve been inside, or how many pictures I’ve seen or documentaries I’ve watched the expansiveness of it never fails to amaze me. You are quite literally surrounded by so much history, it’s absolutely overwhelming. Father Al (after taking pictures with a number of tourists who we’re pretty sure thought he was the pope) took us around, pointing out different statues and giving us fan facts along the way. After an hour of seeing the Vatican we headed to what Father Al calls the “Walmart of Catholicism,” a great store with a lot of cheaply prices but good quality Catholic items. With the papal audience coming up we all stocked up, buying rosaries, holy water containers, medals, everything we could get our hands on. I think the store owners were a little scared by our enthusiasm! Finally after a quick stop for gelato at Old Bridge (I don’t care if it’s a tourist trap, I still think it’s some of the best gelato around) we headed back up to campus. Saturday night Fernando, Tom, and I went out for dinner. Let me explain why this is noteworthy. Excluding dinners planned by the JFRC we hadn’t gone out for a “real dinner” since being in Rome. 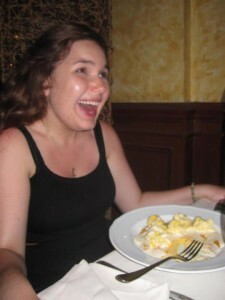 Needless to say we were very excited to try out our Italian and try some local food. The night, however, did no go quite as smoothly as expected. Ordering dinner believe it or not, is not as easy as ordering gelato. After ordering wine for the table (vino tavolo) and an appetizer (which was fantastic even if we didn’t know what we were getting) we began to order our main courses. When looking at the menu we were struck with how inexpensive the pizza was. Only 5 euro for a pizza! Being the Americans we are we then assumed that the pizza must be individual sizes, and proceeded to order three. 20 minutes later we were shocked when three full size pizzas came to our table. Not only that but we also ended up with a cheese pizza, cheese and prosciutto pizza, and an anchovies pizza. What a mess! We had a great time though, and have vowed to return to redeem ourselves. Finally, I ended the weekend by going to morning mass at Saint Ignatius, to see the church in the daylight (it was absolutely breathtaking). I went with a couple of friends to go to their English mass, but it turned out that the English mass was down the street at the Oratory of San Francesco. The church was beautiful and the community was so incredibly welcoming and excited to have us there. If you’re in Rome and looking for an English mass I would highly suggest their 11:00am! Overall the weekend was a busy but fantastic one! Saturday was a day of treks, tribulations, and gorgeous fountains and gardens. 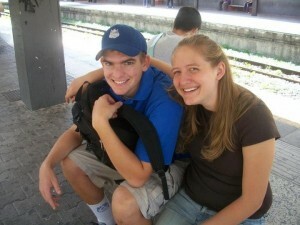 This was the day that four of us went to the small city of Tivoli, an hour east of Rome by train. While I am tempted to write mainly about our frustrations, as they again have to do with the transportation system, I will spare all of you from another round of disguised venting, and focus on the beauty of the Villa d’Este at Tivoli. I will preface the following by saying that it took us quite a bit longer than it should have to find Villa d’Este, thanks to following a disjointed system of street signs, and that getting back to Rome was even more of an oh-so wonderful adventure thanks to the trains. Our trip was estimated to take one hour, but after only half an hour, we saw a sign indicating a stop for Bagni di Tivoli. With the encouragement and assurance from an elderly Italian woman that this was our stop, we got off the train behind her. While slowly, slowly, slowly walking behind her, we had plenty of time to look around at our destination. Good thing, too, because one of my friends noticed a map of the train stops and decided to look at it. She let out a loud gasp and yelled, “this isn’t our stop!” and so we all rushed back onto the train, which was miraculously still waiting. The conductor must have secretly known that a group of American girls would be on board and to be prepared for their delirious behavior. Our actual stop, that was called strictly Tivoli, was another six stops so we were extremely lucky our faux pas was not a major one, otherwise we would have spent a day looking at cows. Once at Tivoli, the real Tivoli, we hopped off the train and wandered uphill to find the Villa d’Este. After arriving at our destination, we paid the eleven-euro entrance fee and went to explore. The start of our journey led us in the actual home, where we saw paintings after paintings on the walls, on the ceilings, everywhere! While the home was historical and interesting to look at, we were mainly here for the fountains. We meandered our way out of the house and onto one of the balconies overlooking the entire grounds. Below us was a massive property where we could see fountains, trees, hedges, and many staircases. Walking between the high hedges, among the trees and greenery, I felt like I was walking in Frances Hodgson Burnett’s Secret Garden. Though, of course, this one was unfortunately full of people and did not have a robin always sitting in the tree. Nevertheless, I tried to block everyone out of my mind and the four of us traipsed about in our secret garden. The fountains were spectacular: huge, intricate, and just plain breathtaking. At one point, we came across a whole wall full of fountains against a backdrop of veins. Though I am not sure, it seemed there must have been around hundred tiny fountains along this wall. Some of the staircases even had a small waterfall-like fountain embedded in the handrail. There were secret pathways everywhere, leading to more fountains and more stunning views. 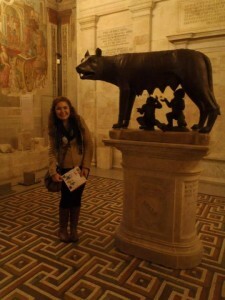 We saw statues of Poseidon, our founders Romulus and Remus, the Holy Mary, and Pegasus. I could have stayed in that garden forever. All I wanted at that moment was a book and hours upon hours of free time to just sit, read, and relax. Soon, however, we decided that we were starving at that it was time to find a place for lunch. We didn’t have to walk too far before we found a quaint place right across from a crêpe stand. Everything we ordered was marvelous. The best part being that they had pasta celiaca for me and it was absolutely scrumptious. We paired that lunch with some crêpe, and for me gelato, and our day seemed complete. We made our way back to the train station and from there had a “great” time getting back. I shall end here, simply because I do not want to ruin the mood of our day. The important thing was that we made it back to the JFRC in one piece and in time for mensa. I’ve had some truly amazing times in the past couple weeks here in Rome– I’m not even sure where to start! I’ll just share with you some of the highlights. First, our study abroad orientation trip to Tuscany and Umbria was absolutely fantastic. 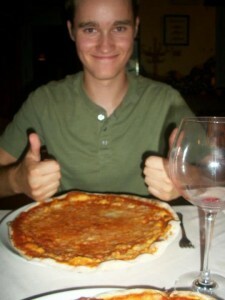 I think I had some of the best food (and in the largest quantities) that I’ll have here in Europe! We saw some beautiful quaint towns, and even witnessed the beginning of the annual large archery tournament between two towns there. I loved watching the men and women dressed in traditional costumes, parading and marching to their band to meet the other towns’ representatives. Last weekend I traveled to Naples with a few friends to find the elusive historic pizza places and to visit Pompeii, one of the things on my bucket list! I can attest that not only did I have the best pizza I’ve had in Italy so far, but I also had the most amazing cappuccino freddo (Iced cappuccino) that I’ve ever had in my life! Walking through the streets of Naples was an experience all in its own. 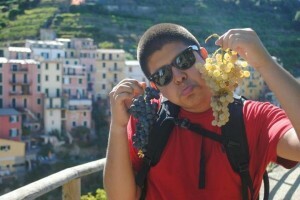 I didn’t feel like such a tourist as I had on our Tuscany trip or when walking around Rome, and that was great. There were dozens of fish markets, cafes, pastery shops, and more. Pompeii was just about the coolest thing I’ve seen just far–I’ve been dreaming of visiting since I read about the historic town as a little girl. I couldn’t believe the absolute enormous size of the city! You can literally walk through the ruins, into the public bath house and beautiful homes, and see right up close hundreds of artifacts discovered when the city was unearthed. It was mesmerizing to me. Seeing a few of the bodies uncovered from the ashes struck me the most–We saw one pregnant woman who was covering her child, another person bunched in a ball and covering their face…it was incredible. I never thought I’d be able to see the artifacts and walk around the ruins myself! Definitely another one of my highlights has been visiting a UN Agency here in Rome. The professor of my International Business Ethics course works for the UN and has a number of connections throughout the various agencies. I was fortunate enough to travel to the FAO, or the Food and Agriculture Organization here in Rome, in order to tour the building and discuss the role of the corruption team there. I had never seen anything like the agency in my life. We got a tour of the Green Room and Red Room, where conferences with representatives from countries all over the world are held. Hearing about how a UN Agency works definitely piqued my interest, and I had a fabulous time. 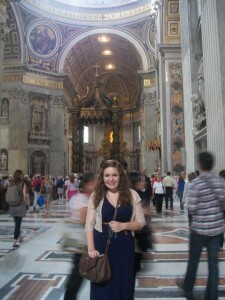 I’ve also had the opportunity to visit the Vatican and St. Peter’s Basilica on my second weekend here in Rome. Several students here at the Rome center received a special tour inside the Basilica from Father Al, who lives at our campus! I loved hearing the history behind various parts of the Basilica, and couldn’t believe how extravagant and intricate the detailing of the building is! Definitely a once in a lifetime, breathtaking experience. Lastly, I’ve been making a point to try out a variety of great places for eating out here. As a girl brought up on Italian staples of pasta and pizza (thanks Dad! ), It’s hard not to want to eat out all the time! It’s difficult in Rome to find non-touristy places, but I have had a ton of fun searching for them. You just really have to be prepared to walk well off the beaten path. Pizza con funghi (mushroom pizza) has been my favorite thing to order out here in Rome, and I’ve yet to order a pasta dish, though I had lots of pasta in Tuscany! On a recent rip to Trastevere with my girlfriends, we found the most authentic sushi place in Rome! All three of us are avid sushi fanatics, and we just had to try it out. Though expensive, it was absolutely amazing. Just thinking about the rolls I had is mouthwatering! Goal: find another sushi place, a bit less expensive and closer to home, for next time I get a sushi craving. I plan to blog more often…it’s harder having to fit in so many stories into one blog! And I’m still trying to figure out how to post pictures on here–it hasn’t been working so far! I’ll keep trying though! Tomorrow I will attend the Papal Audience with other Loyola Rome students, and this weekend I’ll be traveling to Germany for Oktoberfest! Will definitely have plenty to blog about once I return. Days like yesterday are rare and always inspire me. It is unbelievable how many “life moments” can happen within the span of a day, not to mention how much exotic fruit a person can eat. I could write a novella about yesterday, but I will refrain, seeing as there would really be no climax to the story (the entire day was climactic) or conflict other than my literature paper due Monday, which isn’t as interesting. Now please join me while I continue to procrastinate that paper while I write about Loyola’s journey to 10°10′N 106°0′E. 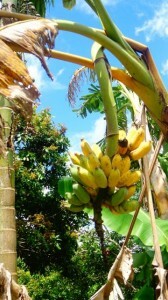 It is common to see banana trees growing in the Mekong. These are ripe and ready to go! If you Google 10°10′N 106°0′E you will find Vĩnh Long Province located in the Mekong River Delta of southern Vietnam. Many local Vietnamese people travel by boat because many locations are easily accessible by water, especially during the rainy season when pathways become muddy or flooded. The soil along the banks is ideal for growing many exotic and traditional fruits such as: banana, mangosteen, durian, rambutan, pomelo, and watermelon. The people also make bricks from river clay, sell prawn and catfish, as well as open their homes to travelers. 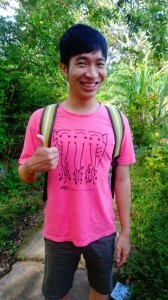 The Vietnamese roommates were invited to join the trip to the delta. We were bug spray ready at 8am. I sat by Neg, a senior sociology major, on the two hour bus ride. We talked about being a young adult in Vietnam, family, and music while we snacked on milk cream filled crackers. I am good friends with Neg already. I appreciate her sarcastic personality which compliments my own and her love for American movies, which range anywhere from Finding Nemo to Ocean’s 11. Half of our day was spent on the water. Traveling from one destination to the next. I have never traveled on a river with such a strong current. The current is faster in the south of Vietnam, especially during the rainy season. The scenery was a constant view tropical trees and houses. It looked exceptionally beautiful in the rain. Many children came out to wave to our boat, shouting “Hello, nice meet you to!” It was nice to meet and wave to them as well. 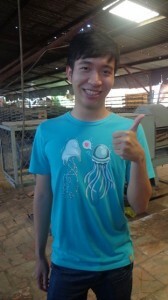 #1: Walking through Vinh Long Market. Many live animals and fruit are sold here. Some animals include: chicks, snakes, birds, lizards, etc. 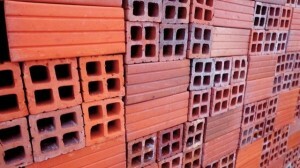 #2: Visiting the brick factory. The kilns looked like giant coconuts, and the bricks themselves were fiery red. They clay to make the bricks comes from the delta itself. #3: Eating lunch at a local home. Menu included elephant ear fish roll with rice paper, veggie and noodles, spring roll, shrimp, and rice noodle soup. I still remember everyone saying “We are going to eat an elephant ear? !” It is essentially a lettuce wrap. 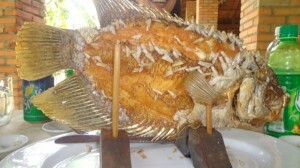 Many fish dishes in Vietnam require you to remove the meat with chopsticks! 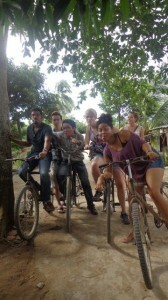 #4: Hiking and biking through the community was by far the best experience I have had so far in Vietnam. 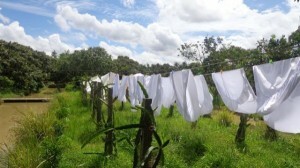 I saw numerous plants, animals, and local homes. #5:Rowing down the river with a local guide. I even wore a straw conical hat for the first time! It is a true symbol of Vietnam. #7: Cooking spring roll’s with our home stay family. #8: Visiting a local floating market. This market will only sell exclusively to the locals. #9: Standing on a bridge with friends at sunset, overlooking the river. 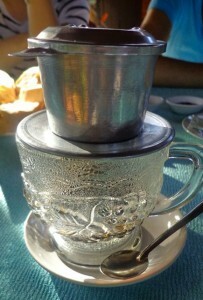 #10: Enjoying a lovely cup of Vietnamese drip coffee, served with condensed milk (of course!) for breakfast. Ten moments seem like the perfect amount to share! For more Mekong photos check out the Flikr slide show. My paper awaits! Fun fact: 99% of my time in Italy has consisted of me having 0% of an idea of what I’m doing. The beauty of this in Italy: it’s absolutely OK.
It’s 4:35AM, a group of 5 guys (me included) get off the overnight train from Rome to Riomaggiore, the southernmost city in the 5-city circuit. Did we bother to book hostels before arriving? Absolutely not. The only solution to this “dillema”? Posting up outside a medieval castle and passing out until the sun came up. Duh. Let me tell you, the view from this castle that overlooked all of Riomaggiore was spectacular. The whole weekend, you could say was completely lucky weekend. We eventually found somewhere to sleep, and paid 20 euros each for an apartment that housed all of us. 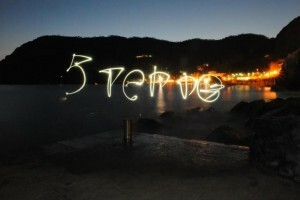 Did I mention that Cinque Terre is absolutely stunning, and is located on the Mediterannean? Naturally, we spend most of our time on the beach and in the water. We even had the opportunity to kayak and climb some awesome rocks in the middle of the ocean. Casual. Riomaggiore in all its glory. 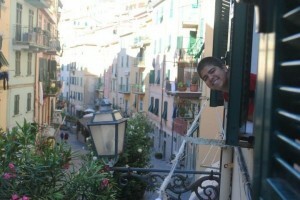 Some good ole wandering around in Manarola. I picked those right off a vine. 1:30PM. A group of 8 friends get off of a one hour train from downtown Rome’s Termini station and step into Velletri, a residential village having their 82nd annual Sagra Dell’Uva (Grape Festival), or so we thought. Let me tell you, I’ve never seen a ghost town before, and Velletri would have been an image supplement in a dictionary for a ghost town. After some exploring, we found out that the festival didn’t actually begin until later that evening, like 6PM later that evening. After some professional bumming around at a local cafe and casual wandering, the time came for the festival to begin. It was stunning. If there’s anything that makes me happy, it’s people happy to promote their culture. 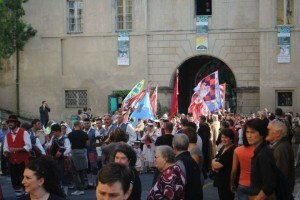 People of all ages were dressed in traditional Italian clothing, singing and playing instruments, and waving that good ol’ tricolored flag. The small town was decked out from head to toe. Do you know those fake grapes our moms used as a centerpiece for a dining table? 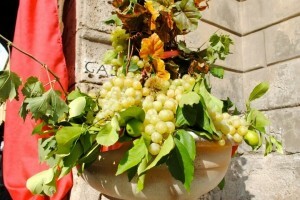 Well, in Velletri, they used real grapes to decorate everything, even the fountain in the square. As you’ve probably already guessed, the wine flowed throughout this city like the Tiber in Rome. We even had the opportunity to sample wines from the surrounding areas (10 glasses for 5 euros, how could we pass that up?). After our fill of wine and ciambelle (an Italian doughnut, but significantly more delicious) it was time to head back. This day, was literally the definition of happiness and perfection. Do I still consider myself lucky to be here? You bet. Remember those decorations I talked about? Oh yeah, real grapes. Pure Happiness. Thank you, Velletri. Classes at the JFRC are a species of their own. Although professors and classes are great in both Chicago and JFRC, I feel that a major difference between the two is that the professors here are able to immerse themselves in their field in their everyday life. For example, my THEO 100 professor, Father Ted Bohr, has teaching resources from the Vatican just a bus ride away. 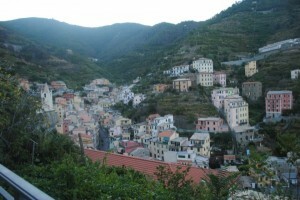 Or, my Aesthetics professor, Stefano Giachetti, lives in one of the most artistic countries in the world! This aspect really enriches life in the classroom. Although my Italian courses with Maria Palladino (a very poised, distinguished, and intense former inspector of secondary schools in Italy for the Ministry of Education) and Flaminio Di Biagi (an extremely animated and very passionate Italian Film History professor) are absolutely incredible, I would have to say that my favorite class is Writing Rome. In Writing Rome, which is my once-a-week on-site class which takes part at different locations across Rome, we focus on incorporating the Roman landscape into different fictional stories. I feel like this class will be really good for me because, being a Biology major, I feel that I have been molded to write too scientifically to a point where my writing gets a bit dull and dry. However, this class would definitely not have half of its appeal if it weren’t for my professor, Elizabeth Geoghegan. When you stop and think about the most quintessential English teach you could ever have, you are probably envisioning Professor Geoghegan. She always pulls up to our meeting spot on her bike or moto, wears something simple yet fashionable (and ALWAYS black), and doesn’t take any crap from anyone. She is that type of professor that makes a true effort to talk with you. I wouldn’t say I have a huge interest in fictional writing, but when I am in her class, her passion definitely rubs off on me. So in short, classes at JFRC are truly unique in the sense that rather than being lectured on different foreign places, you get to see those places, make your own experiences, and truly be immersed in the world which all of the professors are truly and fully passionate about.